From 1814 until 1960, the General Calendar of the Roman Rite contained two different feasts of the Seven Sorrows of the Virgin Mary. 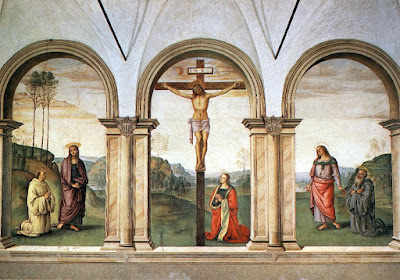 The older of these is the one long celebrated on the Friday of Passion week; the latter is now fixed to September 15th, but was originally a movable feast. The Offices of these two feasts have only a few elements in common, but the Masses are almost identical. This doubling of the feast is not, therefore, a case like Corpus Christi, which emphasizes one particular aspect of what the Church celebrates on Holy Thursday, nor is one a “secondary” feast like the Apparition of St Michael or the Conversion of St Paul. 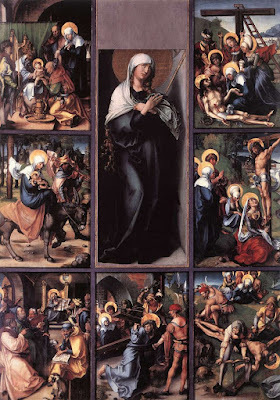 The Seven Sorrows Polyptych by Albrecht Dürer, ca. 1500. The seven sorrows shown here are slightly different from those of the Servite Rosary shown below; counterclockwise from the upper left, they are the Circumcision (considered a sorrow because of the shedding of Christ’s blood,) the Flight into Egypt, the Loss of the Child Jesus in the Temple, the Carrying of the Cross, the Nailing to the Cross, the Crucifixion, and the Deposition of Christ’s Body. The Pazzi Crucifixion, by Pietro Perugino, 1496, in the convent of St Maria Maddalena dei Pazzi in Florence. St Bernard of Clarivaux and the Virgin Mary are on the left, St John the Evangelist and St Benedict on the right. In the wake of the Protestant reformation, the feast continued to grow in popularity, spreading though southern Europe, and most often fixed to the Friday of Passion week. It was extended to the universal Church on that day by Pope Benedict XIII with the title “the feast of the Seven Sorrows”, although none of the various enumerations of the Virgin’s sorrows is referred to it anywhere in the liturgy itself. The second feast of the Seven Sorrows was promulgated in 1668 as the Patronal feast of the Servite Order, which was founded in the mid-13th century by seven Florentine noblemen, and soon spread all over Europe. (St Philip Benizzi, who stands in their history as St Bernard does in that of the Cistercians, not their founder, but their most famous member, was almost elected Pope in 1271.) 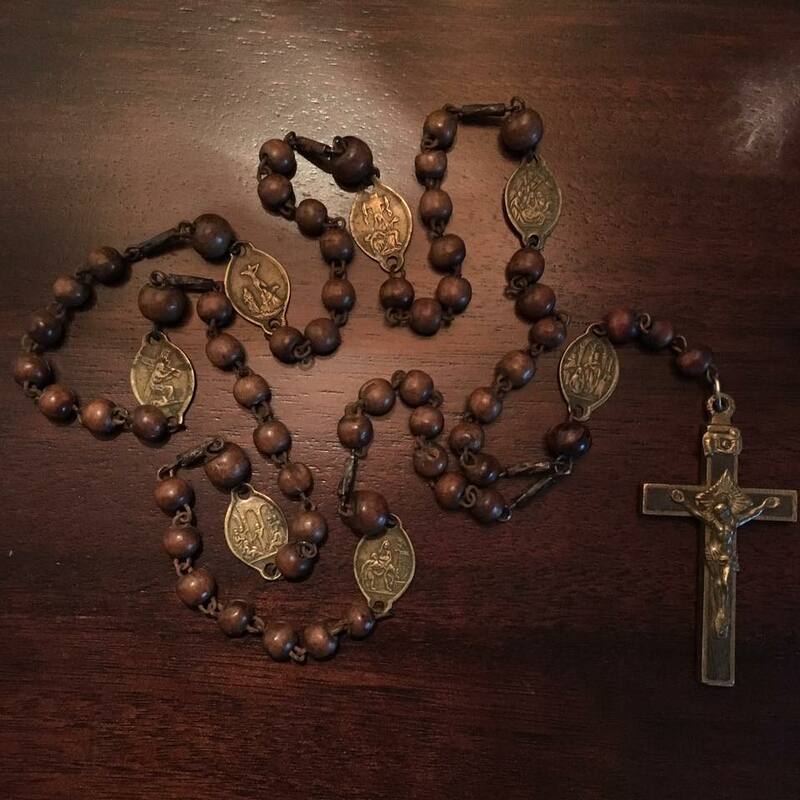 This order had always nourished a strong devotion to the Mother of Sorrows, and has its own rosary of the Seven Sorrows, which are as follows. 4. The Meeting of Mary and Jesus as He Carries the Cross. 6. The Removal of Christ’s Body from the Cross. 7. The Burial of Christ. Michelangelo’s Pietà in St Peter’s Basilica. This Servite version of the feast was added to the general calendar by Pope Pius VII in 1814, after he returned from the exile in France shamefully visited upon him by Napoleon. Part of the Pope’s reason for doing would certainly have been to ask the Virgin’s intercession and protection for the Church in the midst of the many horrors visited upon it by the French revolution and the subsequent wars. It was originally kept on the Third Sunday of September, as it had been first by the Servites, but when Pope St Pius X abolished the custom of fixing feasts to Sundays, it was placed on September 15th, the day after the Exaltation of the Cross. 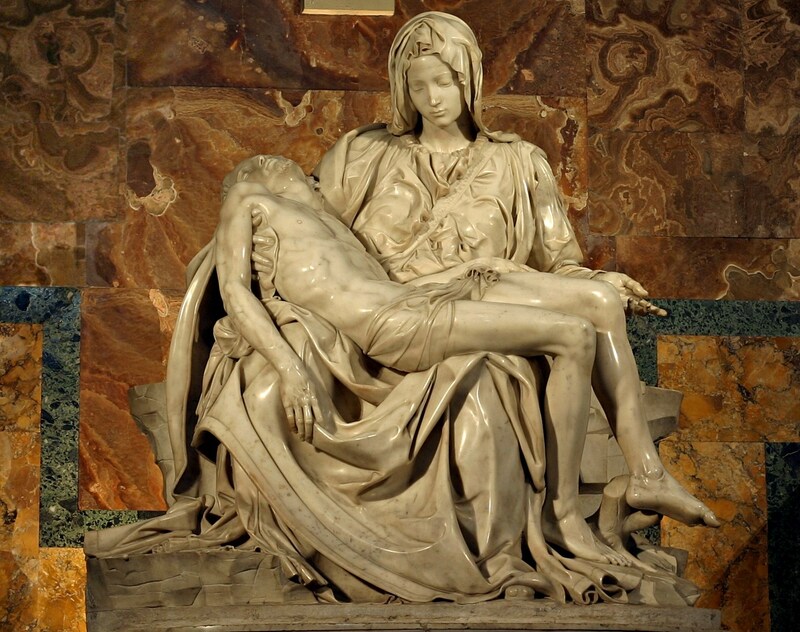 While the connection between the Sorrows of the Virgin and the Crucifixion is essential, the Seven Sorrows was of higher rank at the time, and its new placement therefore had the unfortunate effect of cancelling Second Vespers of the much older feast of the Exaltation. This defect was remedied by the Breviary reform of 1960, but at the cost of a much more serious general defect, the abolition of First Vespers from all but the highest grade of feasts. At the same time, the older Passiontide feast was reduced to a commemoration.